Guy Hollaway Architects announces world's first multi-story indoor skate park in UK seaside town; calls it "controlled adrenaline facility" - Archpaper.com Guy Hollaway Architects announces world's first multi-story indoor skate park in UK seaside town; calls it "controlled adrenaline facility"
In a bid to keep restless youth from fleeing the sleepy seaside town of Folkestone, UK, for more hedonistic pastures, Guy Holloway Architects has conceptualized what is allegedly the “world’s first” multi-story indoor skatepark. 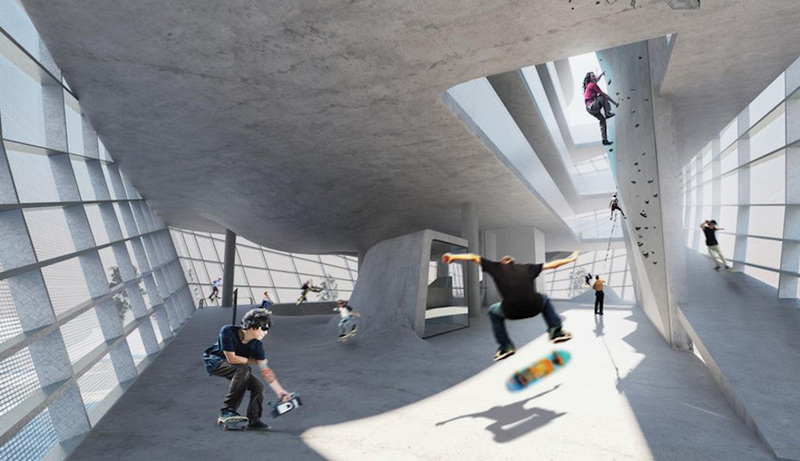 The concept aims to create a larger skateable area without increasing the building footprint, and opening up new stunt possibilities by combining different floor heights. Those who dabble in trial cycling, boxing, and wall climbing are covered, too. 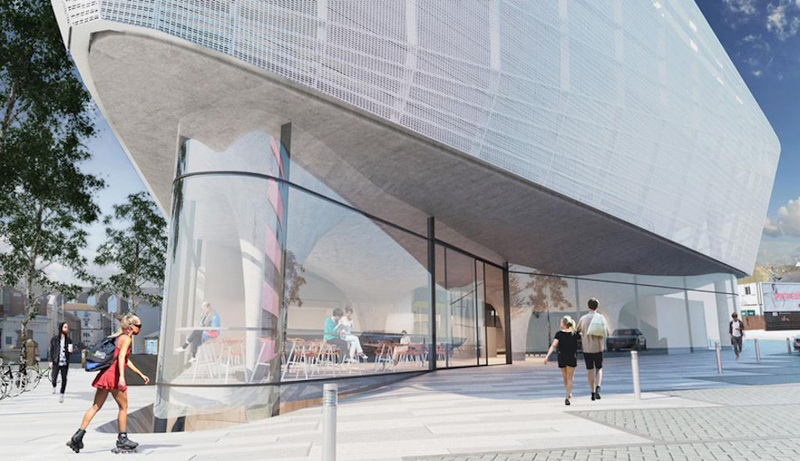 Although the architects concede that installing continuous graded floors will be “an engineer’s nightmare,” with adequate planning, the facility can become not only an exemplary urban sports center but also an architecturally impressive edifice. Four stories will stand above ground. Below grade will be a subterranean boxing ring—the soon-to-be domicile of a local boxing club. 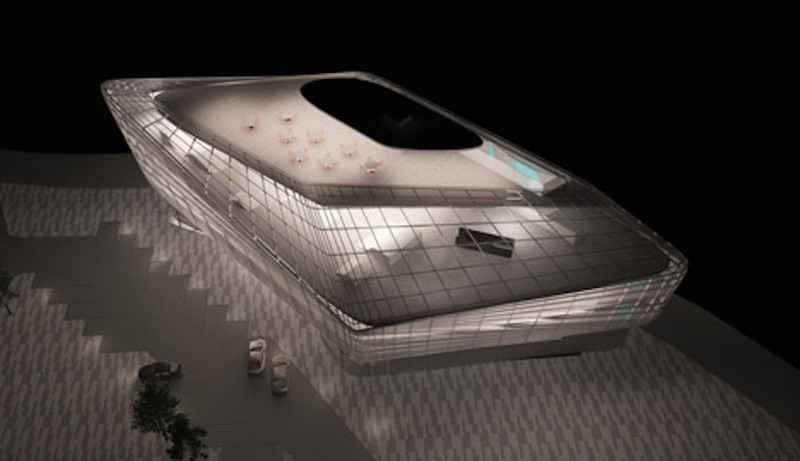 Two undulating floor plates create a series of giant skateable bowls on the upper floors, whose sculptural form is visible from below. Brave skaters and bikers can plunge 16 feet to the level below. 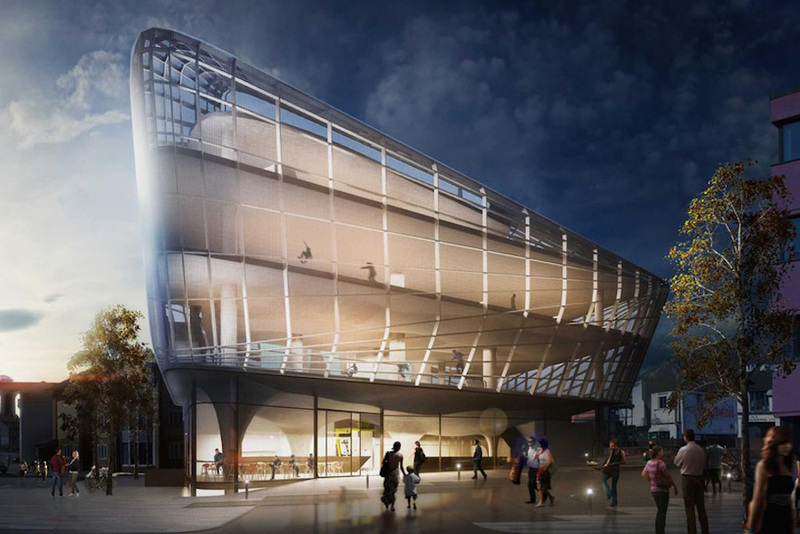 Meanwhile, the building’s outer skin will be transparent to communicate the hive of activity within. 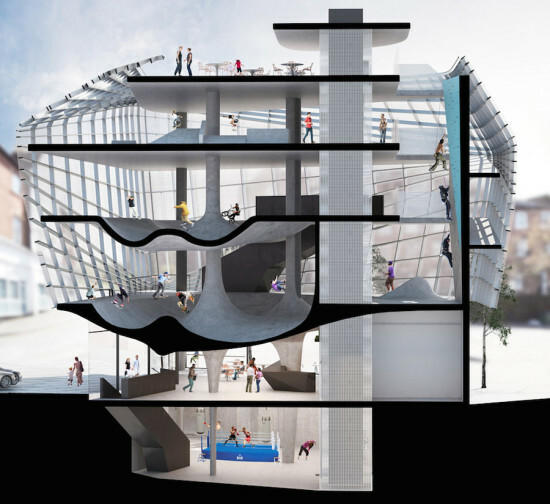 The undulating surfaces provide ramps, moguls, and ledges for executing nosegrinds and tailslides, resulting in a cave-like entrance hall supported by curving concrete columns. “As you come in you’ll see the belly of the blow above you and hear the wheels of skaters above your head as well,” Hollaway told Dezeen. 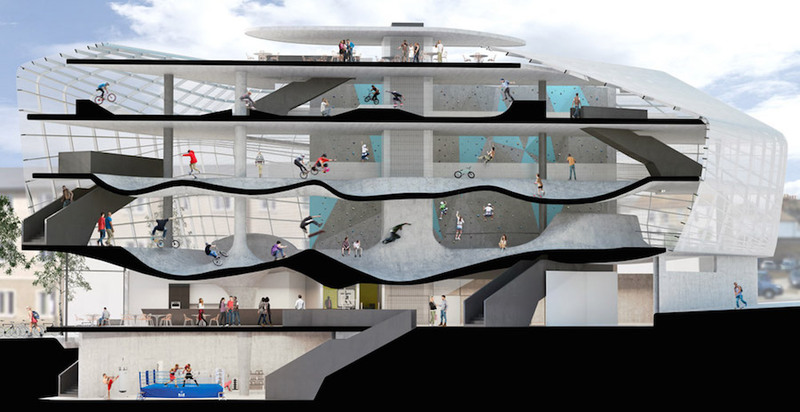 Collaborating with skatepark designers and “famous skaters,” the British architect is designing the building to lure beginners as well as top-notch talent. The team has bandied about ideas to replicate the best parts of the world’s skateparks and transplant them indoors.“We see this as an opportunity to put Folkestone on the map. To the best of our knowledge, this has never been done anywhere else in the world,” said Hollaway. 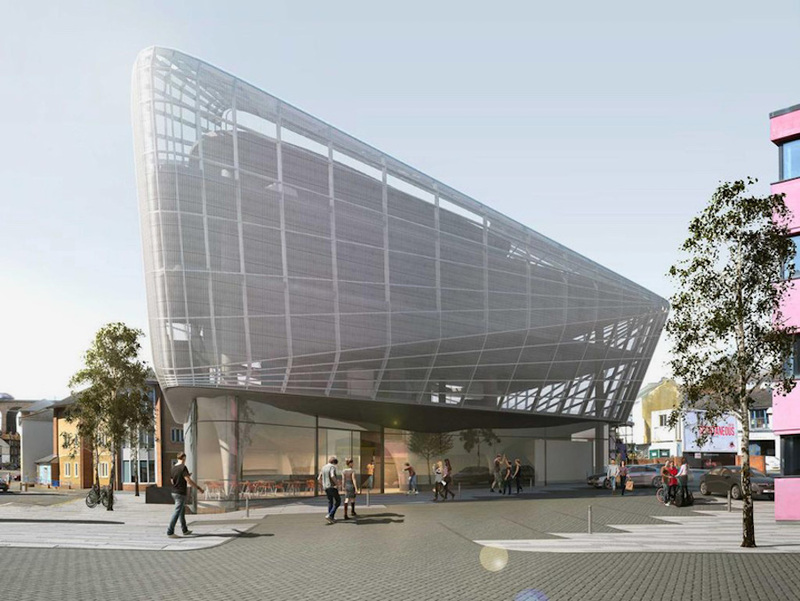 The skatepark will occupy the site of a former bingo hall in the center of Folkestone, which is currently undergoing regeneration plans after its popularity spiked last year by dint of the Folkestone Triennial arts festival. If designs are approved, construction is set to begin in September this year and finish in 2016.